Pretty soon I will have to rename my blog Gin and Rum Hound. But the weather in Denmark at the moment is just perfect for iced rum drinks. The Strawberry Daiquiri holds a special place in my heart. 35 years ago when I was an exchange student in the suburbs of Seattle the elder sister in the family I lived with came home for a weekend and for some reason she, her three sisters and I had a whole evening to ourselves. As the cool college student she was, she and one of the sisters somehow in spite of being underaged sourced the stuff for Strawberry Daiquiris. We felt very grown up, as we sipped them and made spaghetti with garlic bread and swore the youngest to secrecy. 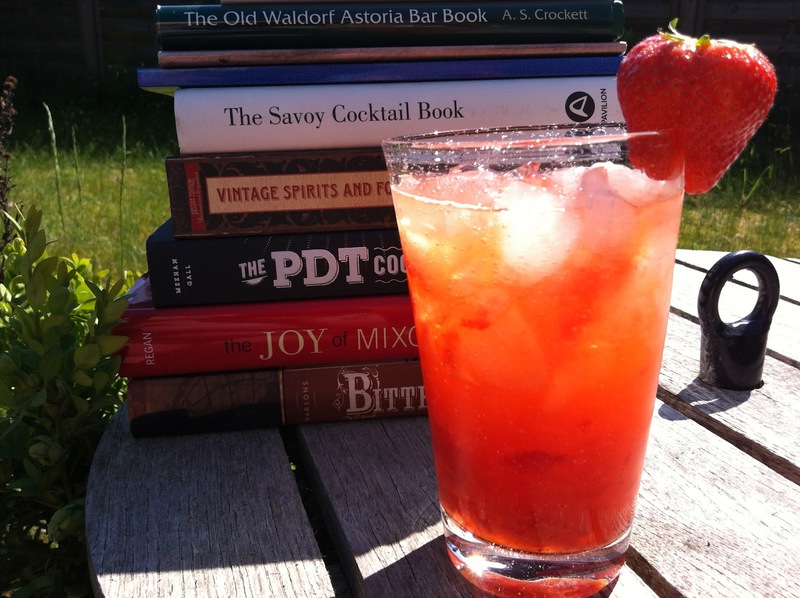 Start by smashing the strawberries in the lime juice and the Curacao at the bottom of a nice glass. Fill it with crushed ice and the rum and stir to cool and mix. Garnish with a strawberry.